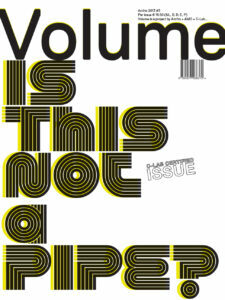 Volume #37: Is This Not a Pipe? Life in buildings is supported by pipes. Ducts, conduits, water mains, and cables support biological and social life in spaces that are today held together by air-conditioning, electricity, and telecommunications as much as by form and materials. But while pipes and the machines they connect are part of buildings, they are often left out of architecture. It’s fascinating to see how architects dealt with pipes in history and what challenges they face today. How did Mies van der Rohe solve this issue, what was Norman Foster’s approach and what does someone like Bjarke Ingels have to say on this? They’ve come up with all sort of strategies, from deceitfully transparent buildings seemingly without any mechanical installation, to faux ‘oil refineries’ showcasing the machinery that makes the mechanism tick. The latest strategy is trying to do away with installations altogether and make the building itself perform without mechanical support: smart ‘downgrading’. This issue of Volume presents C-lab’s research – which will also be a part of next year’s Venice Biennale in Rem Koolhaas’ Fundamentals show – and includes contributions by Mark Wigley, Kiel Moe, David Gissen, An Te Lui, Phil Bernstein, Filip Tejchman, John Hejduk and James Stamp. Also interviews with Matthias Schuler, Neil Denari, Christian Kerez, Bjarke Ingels, Tom Wiscombe, Andrès Jaque, MOS, Juan Herreros, Philippe Rahm, Mahadev Raman, Florian Idenburg and Lothar Schwedt.